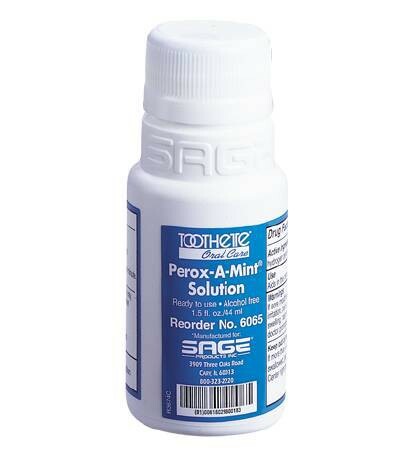 Perox-A-Mint® Mouthwash by Sage Products is a gentle mouth cleanser that includes 1.5 percent hydrogen peroxide. The solution cleans and has anti-bacterial properties that kill and wash away harmful microorganisms without drying the mouth. The use of this oral care solution is to accompany a daily hygiene regiment. This Sage brand oral wash has a light mint taste that will make the experience more pleasurable. 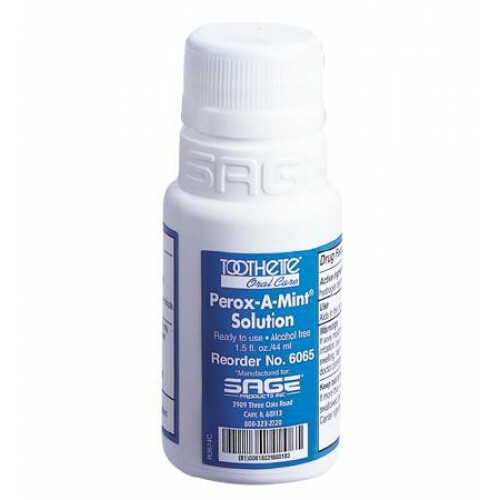 Perox-A-Mint® Mouthwash effectively kills bacteria that cause bad breath and is can be used as an antiseptic gargle. A 1.5 percent mix of hydrogen peroxide is the perfect amount for clearing bacteria in the mouth and healing oral wounds on a regular basis if needed. Often drug stores carry a stronger concentration of hydrogen peroxide and for oral cleansing it is better to use a lesser percentage formula like Perox-A-Mint® . The Perox-A-Mint® solution can be used up to four times daily, swished in the mouth for a minute, and spit or suctioned out. The solution can be used daily for a week, but no more. Children under 12 should be supervised and parents with children under two should consult a doctor or dentist. Never swallow any of the solution and spit out after use. The mouthwash kills harmful bacteria that cause bad breath. The Perox-A-Mint® Mouthwash has a minty, pleasant taste. It is a good solution for a antiseptic gargle. The solution contains 1.5 percent hydrogen peroxide solution, which is gentler than most brands with higher concentration. The peroxide mouthwash doe not contain alcohol.